The official website of Old Man Canyon. Sounds From The Bridge compose, produce, record, publish, and perform their own original music. Pagode with Brazilian DNA. Living music for us is not just a trade. The Less is More has the obligation to bring joy and to represent, on and off the stage, the feeling of one who loves pagoda. The one and only DJ you'll need to get your party or event jumping at the drop of a beat. Commercial events, private parties, bars, clubs, and weddings you name it Vinachi Music has you covered. We have access to all well-known singers in india. Get your crowd up and moving and bring your event to life. Most famous sing are availble here for your entertainment. 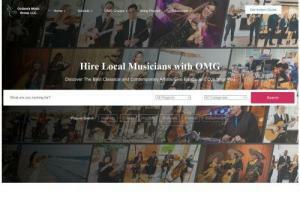 The online music magazine for the unsigned, independent and emerging musicians. Featuring new music, interviews, news, music advice and music videos. Whether you need music production for your next big single or an intimate stage setup for you dinner function, KESA Media will exceed your expectations. Whatever your budget or requirements are, we at KESA Media aim to satisfy all of our clients with excellent service and a memorable experience. Music production and music lessons. A team of passionate professionals who perform music with passion. Our target is to make your event special and memorable with our dedication to top-notch customer service and music. Jewish DJ based out of NY, ready to travel. TSE AV Is a lean operation that delivers world class production events. Shere Pahjab Band is the best band in ludhiya specialist in. Military band. Dhol pyayers. Punjabi dhol. Dholpuri band. Jodhpuri ban. Sahnai pyayers. Our team members are very experienced in this area and this makes your weddings special.